In the B2B industry, customer relationships hold significant value. This is why CRM software is an essential tool for any business aiming for sustainable growth. Tracking existing clients as well as potential customers in the pipeline is necessary to ensuring that nothing falls through the gaps. A CRM is the one tool that allows you to track interactions, revenue reporting, customer retention and more – all under one roof, but only with the right B2B Data. In today’s highly competitive landscape, customer trends, demands and most of all, personalized communication matters. This is why businesses have to be careful about the B2B data in their CRMs. Redundant or outdated B2B data can lead to wasted time, effort and energy. Hence, in order to improve your CRM experience, the first step should be to use precise data. Many businesses out there populate their CRM with B2B contact data lists, but the question is, do they really focus on data hygiene? Data hygiene refers to the practices used to ensure that the data is clean, up-to-date and error free. This includes cleansing outdated data, duplicate records or improper import of different verticals (or fields) to ensure a smooth CRM experience. Most businesses know about data decay – what they overlook is the fact that data in their CRM decays at a rate of about 30 percent annually. In terms of customer retention, acquisition cost and overall marketing/sales efforts, bad data can cost a business significantly. Check out the below infographic to see why data hygiene is crucial to all businesses. Let’s talk about ways to improve your CRM experience. Filtered and updated data leads to a better CRM experience. To improve your CRM experience and give your client their money’s worth, it’s imperative to adopt good data hygiene practices and opt for monthly/bi-annual data cleansing. Without data cleansing, you’d be left with redundant data that has zero value. Following up on ‘expired’ data gives no results and leaves you with the responsibility to weed out ‘actionable data’. Quite frankly, businesses don’t have time to update data regularly within their CRM systems. Combined with the high chance of human error, duplication and other such factors, this means that a great portion of the data (about a staggering 25%) in your CRM is inaccurate. Data decay is a harsh reality. People change jobs, they receive promotions, companies merge, businesses are acquired or many simply fold. There’s a constant cycle of change which affects the quality of B2B data lists. Imagine this – you’ve been in touch with person A (the primary decision marker) and he/she suddenly quits. In such a scenario, your SDR would be wasting precious time and effort in trying to talk to a person who is not even in the same company anymore. Multiply this one instance into 30% (the rate at which data decays annually) and you’re left with numerous missed opportunities. Clean data can raise the chances of a successful customer acquisition and lower churn rate. Not to mention, this could increase sales and be a mark of good reputation. Hence, the quality of data determines whether your CRM experience is a good one or full of wasted opportunities. Having a CRM is not a guarantee of success. It’s not magic and expecting that once you’ve filled it up with leads, you’re good to go is simply impractical. Your CRM is only as good as the data in it. To fully reap the benefits of a CRM system, you need to fill it with quality data – and it doesn’t stop there. Regular data cleansing and enrichment of your database is essential to ensure the success of your sales and marketing team. In short, having up-to-date and quality data leads to a streamlined process through which you can turn cold prospects into sales qualified leads and achieve increased ROI for your business. Another important factor associated with quality and up-to-date data is the alignment between sales and marketing. Ideally, sales and marketing should work together to define the ideal lead, shorten and improve sales cycles and maximize growth overall. However, this is easier said than done. A disconnect between sales and marketing is considered by many to be a top challenge for B2B organizations. Where marketers complain that SDRs do not follow up on their leads properly, sales people face problems due to incomplete or inaccurate data. Bottom line – the data in your CRM is one of major reasons for this misalignment. If you’re not vigilant about keeping your database up-to-date and relevant, chances are that a majority of the leads in your CRM will become outdated within a year. Expecting your team to manually cleanse and enrich data is also not the right solution – consider the high chance of human error combined with the lack of training as a data analyst. The lesson here is that good quality data will lead to better CRM activity and provide better results in terms of customer acquisition and improved ROI. Keep this in mind, CRM begins as a process even when the customer is only a ‘prospect’. When your team is sending out cold emails and exercising outbound strategies, you have already entered the dynamics of customer relationship. 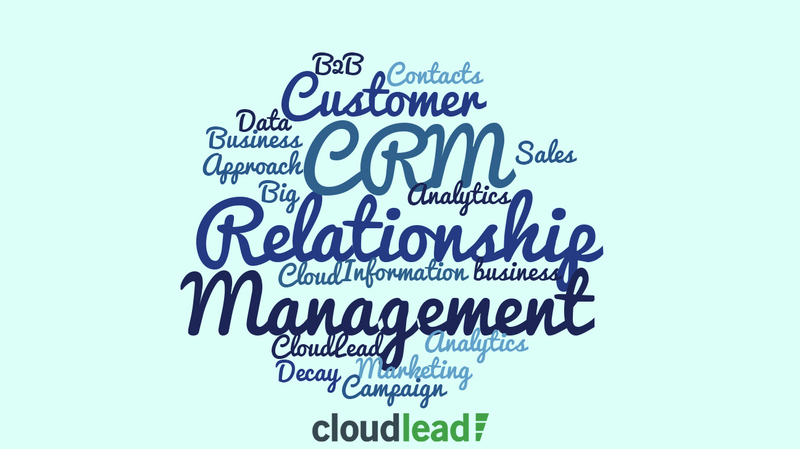 At day end, what you need is the right solution to ensure that the data in your CRM software is enriched and cleansed.